Given a heterogeneous 3D shape collection (a), we perform style co-analysis over projected feature lines (see insets) to spatially located style patches (b) and cluster the shapes based on their styles — all the four shapes in color belong to the same cluster. Spatial localization of style patches enables applications such as style-preserving mesh simplification (c-d). Note the denser triangle distributions near style patches (d). 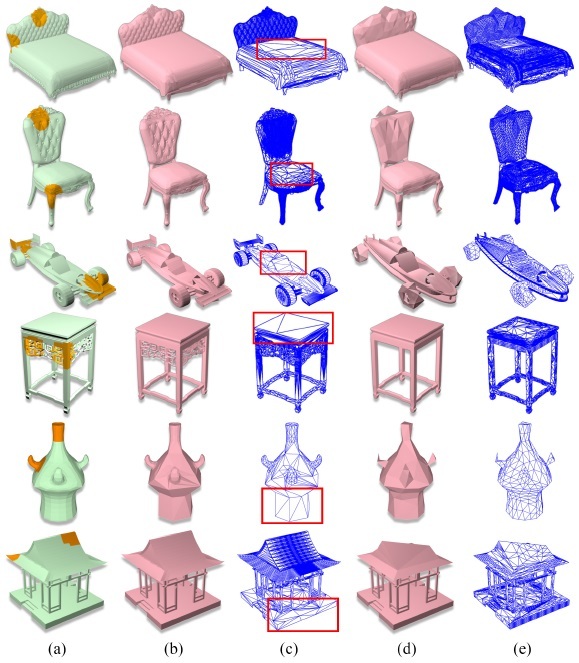 We present a semi-supervised co-analysis method for learning 3D shape styles from projected feature lines, achieving style patch localization with only weak supervision. Given a collection of 3D shapes spanning multiple object categories and styles, we perform style co-analysis over projected feature lines of each 3D shape and then backproject the learned style features onto the 3D shapes. Our core analysis pipeline starts with mid-level patch sampling and pre-selection of candidate style patches. Projective features are then encoded via patch convolution. Multi-view feature integration and style clustering are carried out under the framework of partially shared latent factor (PSLF) learning, a multi-view feature learning scheme. PSLF achieves effective multi-view feature fusion by distilling and exploiting consistent and complementary feature information from multiple views, while also selecting style patches from the candidates. Our style analysis approach supports both unsupervised and semi-supervised analysis. 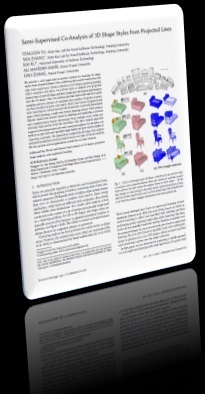 For the latter, our method accepts both user-specified shape labels and style-ranked triplets as clustering constraints. We demonstrate results from 3D shape style analysis and patch localization as well as improvements over state-of-the-art methods. We also present several applications enabled by our style analysis. Our style co-analysis algorithm contains three stages: (a) Patch sampling and pre-selection and candidate style patches. (b) View feature encoding based on patch convolution, and (c) Multi-view feature integration using partially shared latent factor (PSLF) learning. The PSLF performs unsupervised or semi-supervised style clustering and patch filtering in an interleaving fashion. A sample query for our user study for style patch localization. (a) Input shapes. (b) Randomly selected patches. (c) Expert-annotated style patches; (d) Patches returned by our style analysis method. Style-aware mesh simplification. (a) Original meshes with style patches. (b-c) Shaded and wireframe versions of simplified models with style preservation via constrained quadric-based decimation; red boxes highlight significant triangle reduction near non-style areas. (d-e) Simplified models without style preservation, via unconstrained decimation. 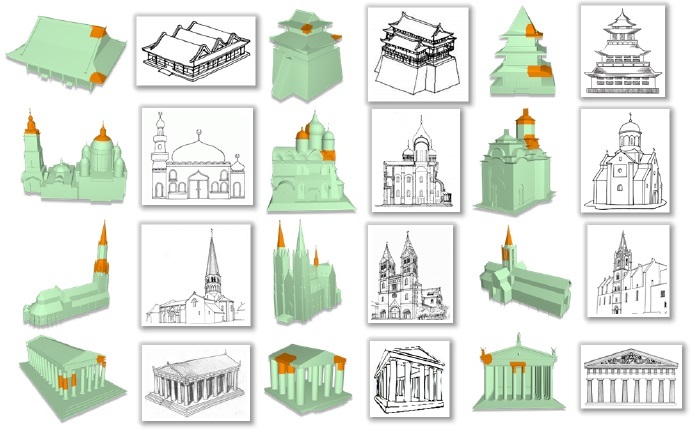 Some examples of recognition and spatial localization of architectural styles on 3D building models. From the top to the bottom row: Asian, Byzantine, Gothic and Greece. For each example, the matched 2D style sketch is shown to the right. Style patches located on the 3D shapes are shown in orange color. We thank the anonymous reviewers for their valuable comments. This work was supported in part by NSFC (61572507, 61532003, 61622212) for Kai Xu, NSERC (611370) and a gift grant from Adobe Research for Hao Zhang, and NSERC PDF for Ali Mahdavi-Amiri. We are grateful to Wentao Wu for help and discussion. The source code and dataset can be found here. Our work is awarded the Graphics Replicability Stamp!